With the forthcoming beatification of John Henry Cardinal Newman, and the great interest and excitement that surrounds that event in the life of the Church, I thought it would be of interest to share some more detailed information surrounding the Cardinal's life specifically in Birmingham at the Oratory, in order to give a slightly more personalized picture of him -- while also incorporating a liturgical angle. Accordingly, I turned to the Fathers of the Birmingham Oratory, who have been of great assistance in helping to bring together some items that will serve this purpose. I have determined to create this series of articles in three separate and distinct pieces. 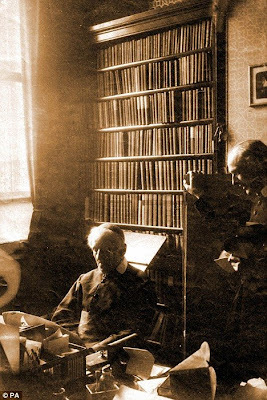 The first, here and now, shall give a view into the Cardinal Newman's study. Some of you may know, and others may be unaware, that Cardinal Newman's study has been left substantially in tact. In a sense, it is rather like a "time capsule" of sorts, and the rooms, from that upon the walls to the books on the shelves, are preserved very much as Newman himself would have seen them and left them. In the second part of this series, we will take a slightly more liturgical view of Newman's life in Birmingham -- though how this will be manifest, I shall leave until that piece is posted. In the third part of our considerations, we shall look at some of the relics of the Cardinal that are in the possession of Birmingham, inclusive of some of the items retrieved during the exhumation of the Cardinal's burial site. With that, we begin with a consideration of Cardinal Newman's room, or study, in Birmingham. John Henry Newman’s room at the Oratory in Birmingham was occupied by the Oratorian and later Cardinal from 1852 onwards, when the Oratory community moved from nearby Digbeth to its present Edgbaston site in Birmingham, England. Apart from the years that Newman lived in Dublin during the 1850s as Rector of the Catholic University, this room was the centre of his life. It was modified substantially only after Newman became a Cardinal in 1879. Before then it had also been Newman’s bedroom. His elevation to the Sacred College gave him the right to a private chapel – which was installed in the room, so for reasons of space he then had to have a separate bedroom. In the Oratorian tradition, the room of each of the Fathers is called a nido – ‘nest’ in Italian – emphasizing that it’s home to the member in a particular way, leaving his own mark upon it, and finding God not in the asceticism of a monastery but in the peculiar ascesis of stability, regularity, private prayer and domesticity that characterizes the Congregation of St Philip Neri. Newman’s room is packed with interesting things that reminds one of different periods of his life. There’s a photograph of St Mary’s Church in Oxford of which he was the Anglican Vicar before his conversion to Catholicism in 1845. Complementing it, perhaps, is a picture of St Giorgio in Velabro, the Roman Church in which he held his title of Cardinal-Deacon. There are photos of the Duke of Norfolk (to whom Newman wrote his famous Letter on Conscience) and of Maria Giberne, a convert lady friend of Newman who became a Visitation sister, and who also painted many of the pictures which hang in the Oratory House. Among Giberne’s works is the painting of St Francis de Sales which hangs above the altar in Newman’s chapel. St Francis may never have met St Philip Neri but he certainly knew his disciples, and even founded a house based on the Oratorian ‘rule’ in Thonon-les-Bains in the Savoy region of South-West France. Newman had a great devotion to this famous author of the Introduction to the Devout Life and the Treatise on the Love of God. There are many books in the room – from Alice in Wonderland and Trollope to St Thomas Aquinas and the contemporary Roman theologian Perrone. A fascinating item is a small image of Our Lady of Lourdes – it was sent by Pope Leo XIII to Newman, and taken as a first sign of the favour that this Pope would show towards Newman in raising him to the dignity of Cardinal. It’s personally initialed by the Pope. Another interesting item is a fragmentary map affixed to the side of one of Newman’s cupboards. Closer examination shows it to be a newspaper cutting – in fact from the Times of 1884 – about General Gordon’s Nile Campaign. There’s a story behind it. After Gordon’s death in Egypt the Times correspondent discovered a copy of Newman’s poem the Dream of Gerontius which Gordon had been reading and annotating. He sent the book back to Newman. It had a profound effect on him. Why? We need to think of the context. Gordon was an English Protestant, and the subject of the Dream – the ascent of the soul to purgatory after death – was far from welcome to the Anglican Church of Newman’s day. The fact that Gordon had been reading it just before his death showed Newman that his defense and presentation of the Catholic faith to the English had borne real fruit. It’s a typical ‘Newman’ story – he valued individual conversion and true spiritual growth over great public or political reforms or schemes of ecclesiastical management. In it Newman’s two mottos, Cor ad cor loquitor and Ex umbris et imaginibus in veritatem have their meeting point: Newman’s own spiritual journey into the light of Christ’s Kingdom helped him to bring that light to others.